In my old life I was very active: long distance running, body surfing, dancing, tennis and pool! 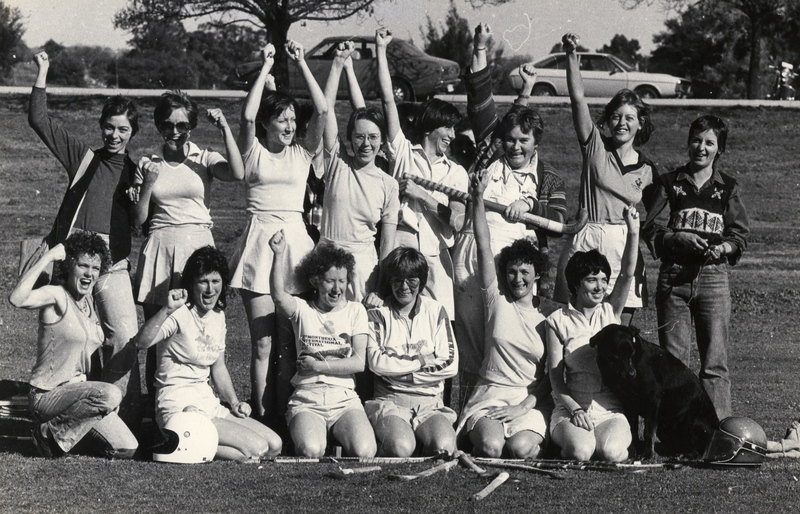 (Here I am in the hockey team, bottom row, far left, bad perm). Let me hear your body talk . . . There are four stages of Copd, four steps down which each of must eventually go. How long we stay on each step will depend on some things out of our control, but I can promise you one thing, you will live a longer, happier life if you exercise. And if you sing. From my vantage point on step 4, I can tell you something about the view ahead. It is hidden in cloud because until we step off the fourth stair, none of us will know what is over there. As one doctor told me, living with end stage Copd is like living in the thin air at the base camp of Mt Everest. But I distract myself from my laboured breathing with the beauty of the views. I take this climb slowly, but I take it. In my old life I was very active: long distance running, sports, dancing. That was the ‘old normal’. The ‘new normal’ is that I have to settle for far, far less. I lose what I gain, quickly. I am a graduate of several Pulmonary Rehabs and it’s fair to say I owe my quality of life to the Chronic & Complex Team at the Shoalhaven District Hospital, who drilled into me the importance of exercise. We country folk don’t mince our words. So in the hospital gym, behind the spin bike, stands the guy we call our personal trainer: A skeleton. The chief exercise physiotherapist, Margaret, warns you can lose all of your fitness in just three days. So a flare up that puts us flat on our backs, also robs us of the fitness we have banked. It’s down to zero, as Joan Armatrading sang. Exercise changes that. The more conditioned your muscles, the easier daily activities become. The easier they are, the more independent you can stay. With Copd, the less you do, the less you’re able to do. Weak muscles need more oxygen, so you can become short of breath just shopping or cooking or talking. I am a foodie with a big herb garden, so when I was told by a dietitian that dried parsley might be the way to go, to save myself from getting puffy chopping up the fresh stuff, I drew a line in the sand. I swore a blood oath the day would never dawn when I would use parsley flakes because of my breathlessness. I will hand grind my peppercorns and curry spices, I will stir my risotto, I will knead my bread and pizza dough, I will chop and slice and dice and grate for as long as I can. So that’s my motivation for exercising. Dried parsley! Yours might be the garden, doing the karma sutra, slow dancing with nose-hose, woodworking, bush-walking, travelling, playing with your grandchildren, or taking the dog for a walk. Find the thing you love and put the pedal to the metal. No excuses. Six days a week. Rest on the seventh. You can, and will, be better than you are. And when you get knocked down, as Chambawamba says, you get up again. It’s all in the mind. So to shore up my efforts at making exercise as natural as eating and sleeping, I have turned to the ‘people’ s philospher’ Alain de Botton for advice on getting past being weak-willed. Alain says our troubles cannot really be blamed on ignorance. We know what we should do. Only we don’t do it. He says there are numerous tactics for providing this assistance. Also, hearing truths put in elegant language or images is beneficial. Wisdom sticks better in the mind when conveyed with the sensuous force of art – in a picture, a poem, or a song . . . This entry was posted in Uncategorized and tagged akrasia, Alain de Botton, blog, Chumbawamba, exercise, Joan Armatrading, motivation, no excuses, Olivia Newton John, pulmonary rehab, reinforcement, Stage 4 Copd, willpower. Bookmark the permalink. Thank you Bill. When you have time, I’d love to hear about your regular exercise regime. I use a stationary bike and lift light weights daily. I like to get down to the beach, but it’s a flower walk, not a power walk. Barb, for the last 14 months my exercise routine has been almost non-existent, though I walk as much as I can. Whenever I go to the grocery store (about 3 times a week), I grab a cart and throw the portable concentrator in it and walk each aisle. I know I am only in the store for 2 or 3 items but I act like I need a $1,000 of food stuffs. That is about it. I do have a pool in the backyard, and get in it almost daily and using a floaty just kinda propel myself around the pool. And the only other exercise I get come from just doing daily chores. Before my last 2 exacerbations I was working out 3 days a week. That included a 1.5 mile walk, 15 mins on a stair master, 15 minutes on a stationary bike, 15 minutes on pedal and row machine, and a twelve station weigh training. Legs were and still are much stronger than upper body. But these days I am so short of breath that it would be impossible to do that. So like I said I have reduced it to walking and carrying. Oh Bill, the less you do, the less you can do. I envy you that swimming pool! How lovely. I’m near a beautiful beach that restores my soul! Hi Barb – great school pic of you and I must say apart from the hair style you really don’t seem to have changed since then! Thanks for the mention by the way – but if you had seen the size of my meal that day you would understand why it needed a few steps and some hill walking to work off the surplus calories 🙂 Having a lovely setting to walk in does help admittedly. Van, ‘Like a bird on a wire, like a drunk in a midnight choir, I have tried, in my way, to be free’. If Alain de Botton is right, supporting each other in exercise goals will crack open the lack of motivation. You have given me a nudge. Thanks. Can’t wait to read about your insights and your new regime. I seem to have periods of being very good and then being very slack, usually post flare-up. Then I pick myself up, dust myself off and get back on the bike. It’s true the less you do, the less you can do! Breaking my hip was a game changer in terms of my fitness: walking with a portable O2 backpack (Inogen) became too hard. Do keep an eye on your bones. I want you round long as possible. PS Isn’t Penny Thornton marvellous – she got me blogging, bless her. And I love Taurus, my life partner Frances, is a Taurus. Me, a Pisces! Barbara – Another beautiful and heartfelt post. Every thought, word, and emotion pulls at my heart. I so understand the compulsive need to do the chopping of the vegetables and the other routine elements – it’s all required for life, literally. Those of us with a chronic disease have 2 choices. We can either live or we can die. If we live, we can do everything in our power to live the best life possible and have a high quality of life as long as possible. I’m a diabetic and I can choose to eat all the carbohydrates I want (which I did do at one time in my life and I also weighed almost 300 lbs) or I can have an appropriate meal plan and not be hungry and lose 160 pounds and be at my goal weight. I’m not going to say it was easy but I stayed the course because I didn’t want it said that I ate myself to death. Since I’m multiply addicted, I have to play most of my cards close to my chest (i.e. no alcohol, no illegal drugs, and on and on). You gave me a new tool to work with whenever an urge is coming on for something to eat and it’s not an appropriate time to eat. You’ve guessed it, I sing! I do have to work on a new exercise routine. My neurologist tells me that gardening is not exercise but I don’t think he’s mulched or pulled weeds by hand or pruned roses in forever. I don’t tackle my garden in a leisurely way. I’m all in. I only have about 3 hours daily to be outside and away from caring for Tom. Sometimes I don’t have that much time, so I try to pack everything in when I can. Anyway, I just wanted to say, I’m so glad I met you. You are one foxy lady and I’d want you on my team any day of the week. Ah Sheri, nominative determinism? I too have given away ‘strong drink’ and I have two bars in my name. Just marvelling at you – this entity in the US of A who flies through cyberspace dispensing love and wisdom. A white witch, a wise woman. I read the original Trinity was ‘Maiden, Mother, Crone’. Crones got a very bad press. Their name began to mean ugly old hag, not wise woman, as intended by the word meaning ‘time’. That experience, gained over time, is what you have and what you share. I think we only survived as a species because we were co-operative. One showing the other how to make a tool, make fire, grow seed. (Monkey see, monkey do). Now, in the 21st century, we must share something more important than tool-making, we must tell each other how to live a good life. Which is a long way round of saying that the world is gasping for wise woman like you. We need to hear those voices, (just as we need to hear from wise older men who are also muted). You’ve overcome some big hurdles, Sheri, and life hasn’t finished fashioning you. It’s not hard to imagine you in your garden and yes, my dear, it counts as exercise in my book. Real gardeners don’t eat quiche! I’ve had to hand over the hard work to Frances, but on any pleasant day I can be found sitting near an Angophora (Sydney redgum) on an old milk crate pulling weeds, listening to the parrots, grateful to be alive. The last time we were moved home from Germany, the shippers shattered my orange crates. I haven’t been the same since. No one uses wood for anything these days. I hadn’t thought about those crates in forever and the mere mention of you on your milk crate brought many fond memories flooding back. Today I worked in the garden for only 2 hours. It was my own choice because I’ve gotten so far behind with the blog. I want to publish but I first must visit everyone that was kind enough to send kind wishes. Tomorrow’s another busy day. I have a consultation with one of Tom’s doctors. Take care my special friend.